“Just wanted to make sure I was adequately protected and everything was done according to the law”: Over 40 percent of those surveyed who had been involved in a motor vehicle collision and ultimately hired a lawyer provided this response. “Someone I know suggested it would be a good idea to talk with a lawyer”: 27 % of persons being asked provided this as a motivating factor for hiring a personal injury attorney. “Was dissatisfied with delays in getting the claim settled and/or was told by the insurance company that my claim was not covered”: 17 % of respondents stated this as the reason for hiring a lawyer. “Was dissatisfied with the amount of money being offered by the insurance carrier”: Approximately 8 percent of those surveyed cited this as a justification for engaging counsel. “After hearing or seeing attorney advertising, I decided it would be a good idea to talk to a lawyer” or “A lawyer or someone connected with him or her contacted my household and offered to represent me”: This comprised 6 % and 3 % respectively for motivations to enlist the services of an attorney following a auto accident or other claim. Wanting to adequately protect your legal rights and assure that persons who are negligent and their insurance representatives follow the law: This is probably THE best motivation for getting an attorney to help you prosecute a claim for bodily injury or death of a loved. The laws of the State of California have been developed over centuries and their absolute goal is to ensure a fair and accessible system whereby persons injured or killed by negligence or wrongdoing be compensated fully and fairly. Hiring an attorney at the suggestions of a friend, family member or “someone you know”: This is also a very valid reason in my opinion to elicit the help of a lawyer following an accident. Referrals can be one of the best ways to find an attorney for an injury claim. However, one caveat I would give would be to use some caution from whom you take advice. Make sure your referral source is someone familiar with the attorney and, preferably, someone who has had a prior, positive experience being represented by that lawyer in a case that is same or similar to yours. Dissatisfaction with shoddy treatment by an insurance adjuster including lousy settlement offers: I can’t count how many times I have been retained by someone who feels like they are being taken advantage of by the insurance carrier for the at fault party. Denial of claims and offering less than full value on claims is a standard operating procedure for insurance companies. Therefore, this is a perfectly good and common reason to hire your own legal advocate. 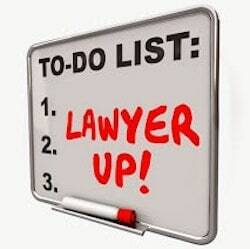 However, I would suggest that getting an attorney involved much sooner in the process is much more beneficial. Attempting to represent yourself up to the point where claims are being denied or “low-ball” settlement offers are being made can lead to mistakes that an attorney may or may not be able to fully correct. This could result in permanent loss of value to your claim! Hiring an attorney based upon an advertisement or a personal or mail contact from a lawyer or “their representative”: This, to me, probably the worst reason to employ the assistance of counsel. While advertising is a legitimate way to obtain initial information about an attorney, hiring a lawyer from a television, radio, or internet ad alone without doing further research on the credentials and expertise of that professional can result in poor legal representation. One of the worst scenarios is retaining a “settlement mill” law firm (i.e. a group of lawyers who engage in heavy, blanket advertising, take in huge volumes of cases, and simply try to “process” them as quickly as possible and with the least amount of effort to simply obtain “a” settlement rather than an “ideal” resolution. Furthermore, hiring a lawyer from a direct, personal contact is THE worst reason to choose a lawyer! Why? Pursuant to California Rule of Professional Conduct 1-400 , it is illegal and unethical for any lawyer to communicate “in person or by telephone” (either directly or through a representative) or to deliver written communications, “concerning the availability for professional employment of a member or a law firm in which a significant motive is pecuniary gain” … “to a prospective client with whom the member or law firm has no family or prior professional relationship. . ..” Any lawyer that would send someone to your home, hospital, scene of an accident or anywhere else where they personally try to persuade you to hire a particular law firm or make similar “cold call” efforts over the phone is NOT TO BE TRUSTED because they are BREAKING THE LAW. It is lawyers like this who permanently damage the reputation of the profession and get us deemed “ambulance chasers” or worse. Any attorney who is willing to act in such an unethical manner will, no doubt in my opinion, act unethically and unfairly towards the client regarding rendering services, settling claims, and dealing up front an fair with the client during the claims process. Does my lawyer have a record of discipline with the California State Bar Association?